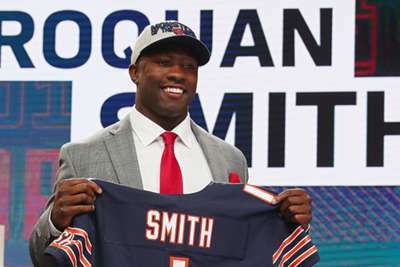 Roquan Smith and the Chicago Bears have finally reached an agreement on his rookie contract. The linebacker signed with the Bears on Tuesday, ending his holdout and becoming the final rookie selected in the first round of this year's draft to agree to a deal. Smith missed nearly three weeks of training camp due to specific language in his contract that stated he would not get his guaranteed money if he was to be suspended under the new rule that states a player cannot lower his helmet to hit another player, or for fighting while defending himself or a team-mate. However, according to a report by ProFootballTalk, Smith's contract was restructured so that he will only lose his guaranteed money if the NFL suspends him three games or more for violating the helmet rule. For fighting or defending a team-mate, the report states Smith would have to be suspended by the league for two or more games for his guaranteed money to be withheld. Smith was selected with the eighth overall pick by the Bears in April's draft following a stellar college career at Georgia. He won the Butkus Award for the best linebacker in college football and was named Southeastern Conference Defensive Player of the Year as he helped Georgia win the conference, earning the MVP honour in the Championship Game. Georgia progressed to the National Championship but suffered a heart-breaking defeat to Alabama in overtime.